This artwork was part of a special slideshow feature for the fundraising auction Ochre: Supporting Indigenous Health. 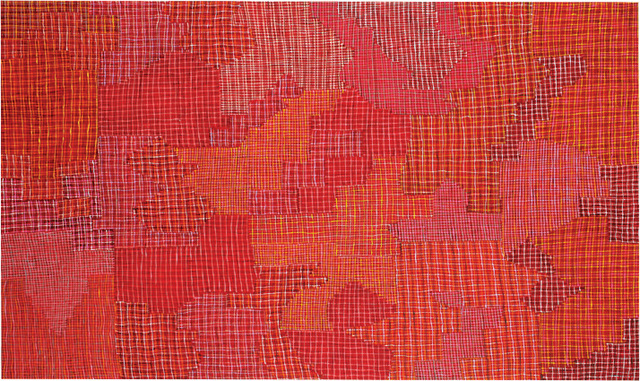 This painting depicts a syaw or fish-net, traditionally woven by the women of Peppimenarti to catch fish and small crayfish in the creeks and rivers surrounding the community. The weaving method of the syaw is the same as the stitch used in weaving the warragarri (dilly bag), except bigger. The pinbin vine (bush vine) grows near the river and is stripped into fi bres that are then woven onto the net. The syaw is used to catch fish, prawn and other edible living creatures in the creeks and rivers.